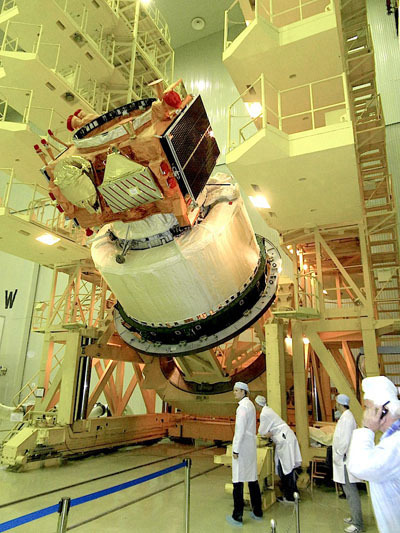 A Russian Breeze M rocket stage, left with loaded fuel tanks after an August launch failure, exploded in orbit Oct. 16, raising concerns of the U.S. military, NASA and global satellite operators on the lookout for collision threats from hundreds of new space debris fragments. The Breeze M stage violently disintegrated some time Oct. 16, dispersing debris in an arc around Earth encompassing orbital zones populated by the International Space Station and numerous communications, scientific, and military satellites. The upper stage launched Aug. 6 on a Proton rocket, and its job was to place Indonesia's Telkom 3 and Russia's Express MD2 communications satellites into geostationary orbit 22,000 miles above Earth's equator. But the Breeze M failed at the start of the third of four planned engine burns, leaving the vehicle and its payloads well short of their targeted altitude. At the time of the mishap, the Breeze M still had more than half of its hydrazine and nitrogen tetroxide propellants in its primary and auxiliary fuel tanks. The substances are hypergolic, meaning they combust when coming in contact with each other. With much of the propellants left on-board the Breeze M, any contact would have generated an explosion. Air Force Lt. Col. Monica Matoush, a Pentagon spokesperson, said the U.S. military was tracking debris from the Breeze M breakup. The Defense Department's joint functional component command for space, known by the acronym JFCC-Space, monitors objects in orbit and issues collision alerts to U.S. government, international and commercial satellite owners. "The resulting debris field and impact to space objects on orbit are being assessed at this time, however JFCC-Space is currently tracking over 500 pieces of debris," Matoush said in an email Tuesday. "We expect that number to fluctuate as work to characterize the debris field continues." Before the explosion, the Breeze M was in an elliptical orbit with a low point of about 165 miles, a high point of about 3,100 miles, and an inclination of 49.9 degrees to the equator. Experts believe the Breeze M stage's breakup likely released a much larger number of debris fragments than are being tracked by the U.S. military. The Joint Space Operations Center, based at Vandenberg Air Force Base, Calif., uses an array of ground-based radars, optical telescopes, and a satellite equipped with a gimbaled visible camera to detect space debris at least down to the size of a tennis ball. Many more smaller objects from old satellites or the disintegration of rockets like the Breeze M are untraceable. The breakup was mentioned in a daily International Space Station status report posted Tuesday on a NASA website. The debris cloud is "believed not to be insignificant," officials wrote in the daily update. As of Tuesday evening, there were no orbital debris threats to the space station requiring any action, according to Josh Byerly, a NASA spokesperson. The 450-ton complex can change its orbit, when necessary, to avoid individual pieces of space debris. 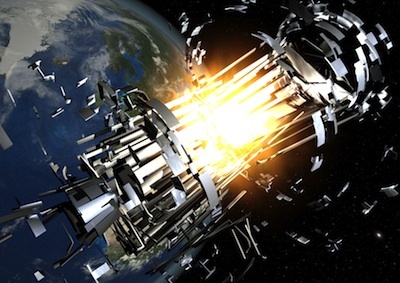 The maneuvers have become more common since 2008 after a Chinese anti-satellite test and the high-speed crash of two satellites collectively sent approximately 5,000 chunks of space junk into the paths of spacecraft in low Earth orbit. The Oct. 16 breakup marked the third explosion since 2007 of a Breeze M stage left with partially-full propellant tanks after a launch failure. 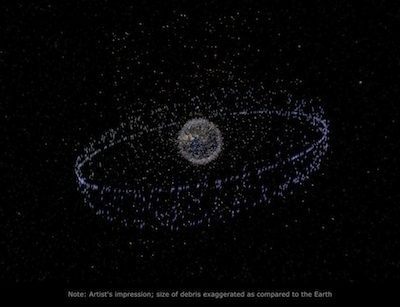 Each of the previous Breeze M breakups in 2007 and 2010 produced about 100 pieces of debris, according to NASA's orbital debris program office. Another Breeze M upper stage from a launch failure in August 2011 is still intact in orbit and has not ruptured yet. A Breeze M stage's tanks hold 19.8 metric tons, or about 43,600 pounds, of propellant when filled. The Breeze M's propellant tanks are normally depressurized after a successful mission to passivate the stage, according to International Launch Services, the U.S.-based, Russian-owned firm overseeing commercial Proton launch services. The Aug. 6 failure occurred on a mission managed by Khrunichev, the Russian builder of the Proton rocket and Breeze M upper stage. Investigators found fault with a component of the Breeze M's pressurization system. "The passivation of the tank pressures coupled with the depletion of nearly all the fuel makes the stage effectively inert," said Karen Monaghan, spokesperson for International Launch Services. "This is a standard procedure for all Proton missions." But after an anomaly which leaves the Breeze M with volatile leftover hypergolic fuel, there is no procedure for passivating and safing the stage or dumping the propellant overboard. "Recognize that passivating a vehicle after a malfunction can be more challenging than passivating one after a normal mission," said Nicholas Johnson, chief orbital debris scientist at NASA's Johnson Space Center in Houston.